The New Orleans Marriott at the Convention Center's new Business Travel Basics package covers all the bases for a comfortable stay while on the road. This New Orleans business hotel knows what it takes to keep corporate guests coming back. Whether traveling solo for work or coming to the Big Easy for a meeting or convention, this luxury hotel is located directly across the street from the Ernest N. Morial Convention Center. Positioned in the Warehouse/Arts district of the city, it is also within walking distance to the famed French Quarter, Harrah's Casino, the Port of New Orleans and many world-class shopping and dining establishments. The on-site Wolfe's in the Warehouse restaurant is a sophisticated dining destination that specializes in rich, Creole cuisine prepared by celebrity chef Tom Wolfe. A wonderful New Orleans riverfront restaurant for lunch meetings and business dinners, Wolfe's promises savvy service highlighted by an elegant atmosphere. The New Orleans Marriott at the Convention Center makes it their goal to always blend business with pleasure. Discover a New Orleans, LA hotel that delivers a legendary experience rich with historic elements at the Marriott New Orleans Convention Center Hotel. Housed in a former cotton mill from the mid-1800's, this riverfront hotel in New Orleans expertly combines classic antiques with modern amenities and trendy decor. Indulge in luxurious accommodations, as well as fine dining at Wolfe's in the Warehouse featuring exceptional Creole cuisine prepared by celebrity chef Tom Wolfe. Take advantage of the fully equipped business center and 24,464 sq ft of flexible meeting space designed for corporate events. Have your expectations exceeded when you make your New Orleans hotel reservation at Marriott New Orleans Convention Center Hotel. 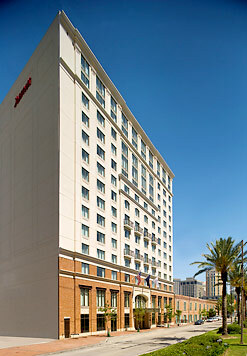 For more information or to make a reservation, call 504-613-2888, or visit http://www.marriott.com/hotels/travel/msymc-new-orleans-marriott-at-the-convention-center/. *Valid seven days a week through 11/15/08. Based on single occupancy. To view entire package, visit http://www.marriott.com/hotels/specials/mesoffer.mi?marshaCode=msymc&marrOfferId=182341.